This beautiful hotel, which used to be a private estate, has been completely renovated and redesigned to the highest standard. On the beach front of the Berawa Surfing beach, a surfer's paradise, it is the perfect place to stay for a relaxing, revitalizing break. Within easy reach are other beaches, the Nirwana Golf course and the Tanah Lot Temple. Facilities at the resort include free parking, an outdoor pool, a gym, fitness, spa and wellness centre, on site water sports, barbers, beauty and gift shops. A choice of 3 restaurants and evening entertainment complete the experience. The modern, elegantly furnished spacious suites offer ocean views through panoramic windows, private balconies, satellite television, air-conditioning, safes, mini bars, tea and coffee makers and iPod docking station. Non-smoking rooms area available as are facilities for the disabled. 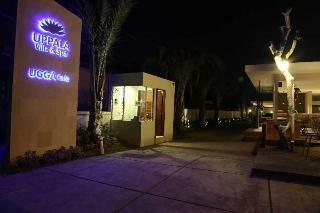 Located at Umalas - North Kuta, the resort is situated in just 20-minute drive from The International Airport and 5 minutes to Seminyak centre , 10 minutes to Canggu Club & Finns Beach Club also Petitenget beach , 15 minutes to Kuta and Legian area , The impeccable personalize service assures that guests stay shall be a memorable one. Guests may enjoy a two-storey restaurant with a magnificent view of rice field from the second floor. 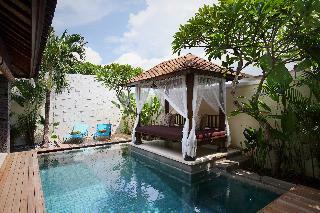 The hotel comprises of 19 beautifully appointed private villas with individual swimming pool. 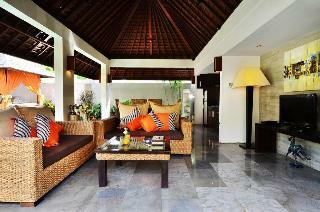 All of them feature air conditioned bed room, spacious bathroom and open air shower open. Further amenities include a cosy dining area, a kitchen and a TV with satellite and international channel. To complete the service, the hotel also offers a broad range of spa treatment. Further recreational facilities include water sports, horse riding and golf arrangements. 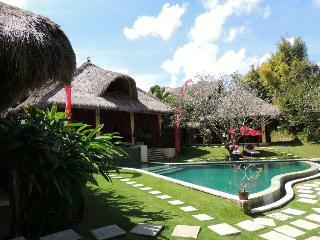 This villa complex is located in Kerobokan, lying just a 15 minutes' driving distance from Petitenget Beach. The complex is located within easy access of a number of attractions in the area, including Uluwatu Temple and Denpasar City. Ngurah Rai International Airport is located just 18 km away. Guests will find themselves in close proximity to a number of shopping opportunities, dining options and entertainment venues. This wonderful complex features beautifully-appointed villas, which combine luxury and comfort with modern convenience. The complex affords guests a number of exemplary facilities, meeting the needs of discerning travellers to a high level of excellence. Surrounded by the rolling rice fields and within its own private tropical garden in the beautiful Balinese countryside, this holiday resort is the perfect place for escaping from the daily stress and enjoying life at its fullest. Guests can get involved in the yoga classes or those who feel a little more adventurous can visit the horse riding school. After an exciting day full with outdoor activities they can relax with a treatment from the spa and wellness centre before heading to the private pool in order to perfect that healthy tan. The onsite cafe can take care of the dining where guests can have their pick between the delicious Indonesian, western, Chinese and Japanese options. Afterwards they can head to the bright and airy bedrooms that are housed in the villas and that come equipped with a flat-screen TVs perfect for a relaxed evening with popcorn and a movie. 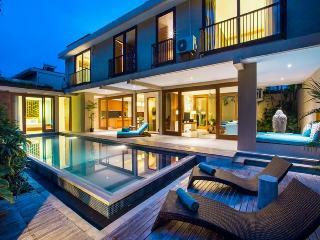 This modern villa complex is located in the centre of Kerobokan, in north Kuta. The lovely Seminyak Square with its white sandy beach and the lively area around it is only 10 minutes' free shuttle service ride away. Guests who would like to explore it at their own pace can use the bicycles hiring service. The property is the perfect place where to relax, have some fun and forget about the daily worries. The private pool villas offer seclusion with the convenience of the natural village of Kerobokan. They are equipped with flat-screen TVs, air conditioning and a terrace with either a pool or garden view. For a delicious meal guests can visit the excellent restaurant located on the premises. There they can enjoy a large variety of traditional and international dishes and premium beverages to complement them. The Kemilau Hotel & Villa is a sophisticated retreat that brings contemporary Balinese elegance to the vibrant Canggu lifestyle district. It is a design concept that embraces the spirit of a traditional village infused with essential modern home comforts. 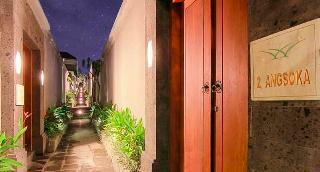 With just 14 rooms and supporting facilities, the property anticipates the needs of seasoned travellers who value privacy and peace of mind.The Kemilau Hotel & Villa lends itself to lazy days of tropical relaxation and is perfectly placed to make the most of Canggu's iconic dining and after-dark scene. 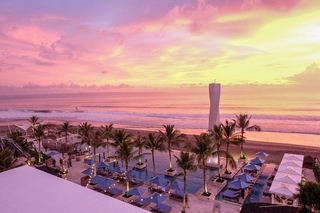 It is just a 40 minute drive from Ngurah Rai International Airport and is a strategic base for venturing out to enjoy everything that the island has to offer. Signature Balinese hospitality coupled with meticulous attention to detail promise an enriching stay filled with meaningful experiences. Located in the Umalas and Kerobokan area, the resort gives guests an authentic impression of Balinese country life, not far away from the lively area of Kuta. Beaches are located around 3-5 km from the resort, which is only 15 minutes' drive from Kuta city centre and 20 minutes from Bali International Airport.This boutique resort is set amidst a beautifully lush tropical garden and welcomes guests for private and intimate vacations, complete with personal service, nestled in between rice fields and coconut trees. Offering a total of 7 guest rooms, this air-conditioned establishment, which was renovated in 2008, features a lobby with 24-hour reception and check-out service, hotel safe, currency exchange facilities and a TV lounge. The café, bar and restaurant cater to guests' dining and refreshment needs, whilst the car park and garage may be of use to those arriving by car. For additional fees, WLAN Internet access, room service, a laundry service and bicycle hire are at guests' disposal.All rooms are in round, freestanding, two-storey chalets, built with local natural materials of stone and wood in typical Balinese style. Each room has elegant high-class fittings and furniture. The en suite bathrooms come with a shower and hairdryer and the bedrooms are furnished with a king-size bed. In-room amenities include a direct dial telephone, satellite/cable TV, Internet access, safe, minibar and fridge. Also included are tea and coffee making facilities, an ironing set, individually regulated air conditioning and a balcony or terrace.Guest can take a quick dip in the outdoor swimming pool for relaxation or for an additional charge, enjoy a Balinese massage or horse riding at the stables located near the hotel. There is also a children's swimming area and a poolside snack bar. Guests may kick back on the sun loungers under parasols on the sun terrace or relax in the hot tub. For an additional fee, guests may take advantage of spa treatments or hire a bicycle. Lalasa Villas is a contemporary Balinese complex featuring a collection of just 12 self-contained holiday villas located in the lifestyle village of Canggu. The property is within easy walking distance to Berawa Beach for surfing and is the perfect base to explore Bali at a relaxed pace.Each two bedroom villa has been designed for absolute privacy with modern home comforts to enhance overall quality of stay. Lalasa Villas is perfect for couples, families, surfers and even small groups travelling together with a total of 24 rooms available.The property is supported by Warung Lalasa, a casual street-front eatery serving hearty breakfasts and great food until late. Lalasa Spa is staffed by trained therapists to perform nurturing body and beauty treatments for head to toe rejuvenation.